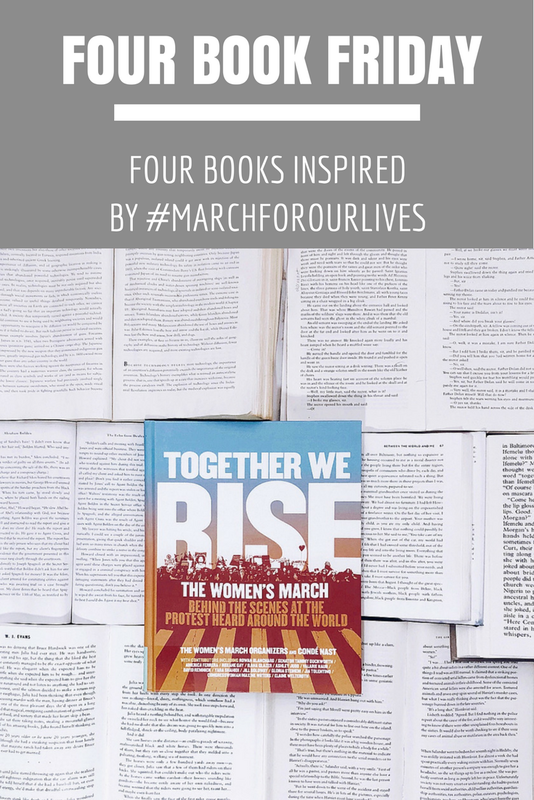 Four Book Friday | March For Our Lives — TBR, etc. Today, I felt compelled to share a couple of books inspired by the March for Our Lives, a student led movement to advocate for stricter gun control laws and an increase on the availability of mental health resources. It's incredible- through the use of social media, the survivors of the Stoneman Douglas High School shooting in Parkland, Florida and thousands of other teenagers rallied together to push for a call to action. On March 14th, students, teachers, and staff members participated in a walk out from schools all over the country to protest Congress's inaction to do anything other than Tweet thoughts and prayers toward creating stricter gun control laws that could play a role in eliminating such violent acts. On March 24th, students from Parkland along with thousands of others will march on Washington to call for school safety and gun control. From the March for Our Lives website: “No special interest group, no political agenda is more critical than timely passage of legislation to effectively address the gun violence issues that are rampant in our country.” Below, four books that either deal specifically with school shootings or activism to inspire. I loved this book but I almost hasten to recommend it because Picoult does such a great job crafting all of the characters that you end up feeling bad for everyone involved, including the shooter. He was severely bullied throughout his life and the book almost seems to suggest that shooting is a natural conclusion that even the nicest kid can come to if he's pushed far enough. Absolutely, bullying is a problem and no one should be subjected to it. However, suggesting that the school shootings would stop if kids would just be nice to one another is victim blaming and unhelpful. Still, Nineteen Minutes is a powerful book that's stuck with me since I first read it in 2007 and is most definitely worth the read. Columbine is an event that very much sticks out in my mind as a defining point in history. I was in HS in 1999 when the tragedy happened and I still remember the "Trench Coat Mafia" frenzy. The shooters were thought to be misunderstood goths and there were a ton of misconceptions floating around about what happened on that day. Columbine is a result of Dave Cullen's thorough research to try and shed light on what actually went down. The book was published in 2009 on the 10th anniversary of the event. Cullen writes about Columbine with respect and thoughtfulness. The events are examined from the viewpoints of the shooters leading to the event and the survivors struggle in the aftermath. It's a tough read, but powerful. I haven't read this one myself and I've seen some mixed reviews. However- I do think this subject is important to tackle and I applaud the author for doing so in the YA genre. This story is targeted for young readers and is about a shooting in a high school, where students and faculty get locked in an auditorium for 54 minutes as a shooter lets loose. The author focuses on what the victims are going through and the reader gets to read through texts and goodbyes to their loved ones. Some of the criticism of this comes from the extreme portrayal of the shooter as evil and the victims as good. In real life, we know these shootings are not just good vs evil, but I still wanted to add this to the list for your consideration because it does open up a conversation. This is a beautiful coffee table book featuring powerful photos and stories about The Women's March in 2017. It's got interviews from the planners of the march, photographs, and essays by female activists. I didn't realize it, but at 3 million people, the women's march was the largest protest in American history. I'm definitely going to add this to my collection! What do you think? Do you have any that you could add to the list?